It is commonly accepted that men pay less attention to their appearance than women. Another undeniable fact is that women pay attention to well-groomed men. So, the conclusion is if you want to be noticed, you’d better look after yourself and have a go with our men short hairstyle ideas. Undying classic haircut will help you create a general appearance of a well-groomed man. Accurate lines, strict edges, styled bangs undeniably accentuate your personality and breed. Choose a long or a short bang, style it according to your face features and enjoy yourself. Classic haircut is suitable for those leading a business life style and can’t afford casualness in their looks. Use hair products to fix the cut and give your general appearance a glamour look. A bit of gel and hairspray will complete the image. Young boys may enjoy a Canadian hairstyle. It is a variation of a classic one but it is more lively and active. More hair is left on the top with hanging bangs. Sometimes these bangs may hide half of your face. The sides and the back are cut shorter creating something like a hat over. This haircut makes your hair jump while walking, feeling air through the locks creating a very picturesque look. The upper locks are cut in edges (steps) giving more volume and liveliness. You have to see your hairdresser often enough to refresh the hairstyle and not to look messy. Do you want to stand out from the crowd? Are you eager to attract others’ glances? You should choose an undercut. It is neither neat, nor casual but be sure everybody will remember you as it has been on top of the charts from the last several years. 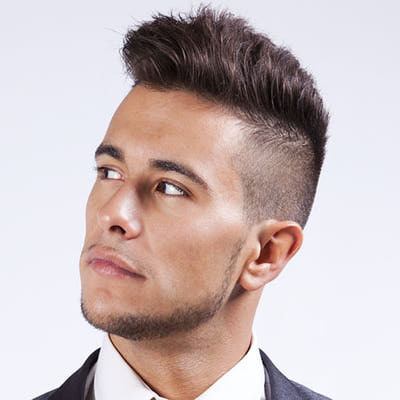 This haircut technique is produced cutting or shaving the sides quite short while the top sticks up creating a rebellious appearance. The top hair can be very short, medium or quite long depending on your personal likes and mood. This hairstyle is for those who are not afraid of being talked about. Bobs can be put into this category creating an unforgettable glamorous style for you. Some guys consider that bob is more suitable for women. But look at these celebrities wearing bobs and change your mind. You can have a straight, wavy or curly haircut. Curls are cool as well for creating a mysterious look. It seems like bobs are specially designed for artistic people who don’t have the same opinions of things as others. 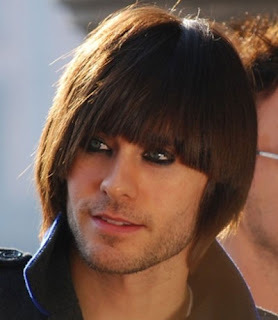 Emo style is a dramatic one which can be used for adding mystery to your whole looks. Teenagers usually choose this haircut to find their own personal style, highlight their personal features and to stand out from the crowd. Colourful streaks can be used to add some brightness to the image (white, yellow and red colours are the most popular). But be careful. Having this cut people will treat you differently; you’ll have to behave correspondingly. Totally shaved men make us feel strange, we unconsciously respect and fear them. This is due to the brutal way of looking of totally shaved or close shaved men. Lots of celebrities choose these styles to emphasize their inner strength, courage and decisiveness. Whatever men short hairstyle idea you choose, remember to stay yourself and not to lose your personality. We hope that this article will help you find yourself and feel free and active with it. Act!